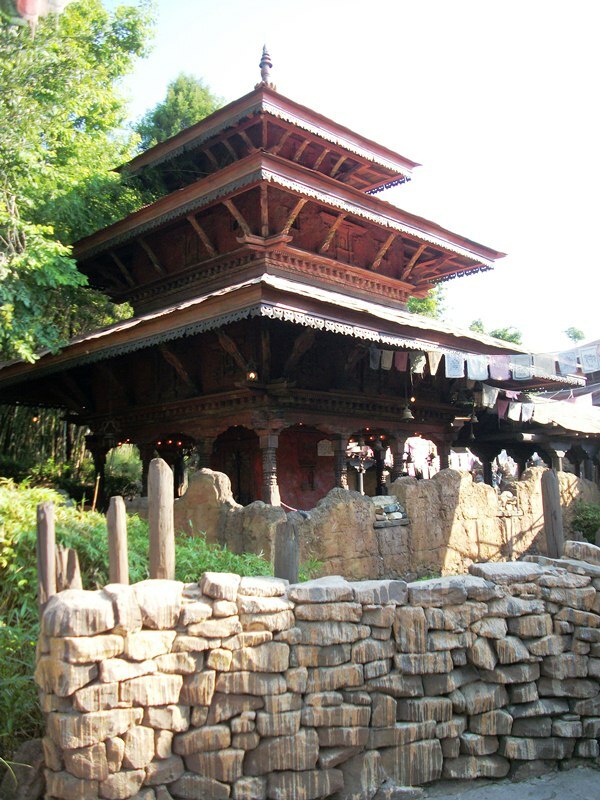 After booking passage for your excursion known as Expedition Everest, guests pass around a courtyard and a temple structure. Generally, only with very long lines, are guests stopped back at this temple, where the bells that are just within reach are simply too much of a temptation and can be heard regularly. There are carvings in every corner of this temple, on the stone walls and even into the wooden nooks of the various roofs. The real question is, why would this temple need to be included as a stop along the journey to the mountain? In 2005, between August and October, the team that would build Expedition Everest took two of their own expeditions, one to China and the other to the Eastern Himalayas. Part of their mandate was to find structures that would be required for everyday life in the region. Homes, public spaces, meeting halls, temples, mountains, and foliage were all well documented on these trips. The temples, known as mandirs, are essential to daily life. In almost every corner of a mandir, you can find carvings of spirits and deities, and many come to these spots for refuge from the elements. Sound familiar? If you haven’t noticed all of the incredible little details that fill the mandir of Serka Zong, I implore you to visit Expedition Everest and really take time to look up down and all around. If the line isn't quite long enough, go ahead and let other guests pass you by, they’ll be thrilled at gaining ground in the queue and you will be amazed by what you see that everyone else overlooks. On a side note, I love how convincingly old and genuine that wall in the foreground appears to be. Rich, I could do a whole series of articles just looking at the walls in Serka Zong and Anandapur!